DW's John Good (The Wood Master) Does It Again! which I review below my interview with Jim Uding of Dixon. Innovation for the sake of innovation without serving a purpose is futile but when DIXON innovates their hardware it always seems to make things more functional and ergonomically pleasing. Case in point is their new drum key named the BRITE KEY as part of their INVENTOR SERIES. It’s Brite as in illumination and is also a bright idea. I like traditional drums, so to deviate from the traditional drum key was a leap of faith for me. Having previously been impressed with DIXON innovations I grabbed the BRITE KEY with a little trepidation but an open mind as I decided to give it a try. First of all it does function as a drum key, but I wanted to see if it would open a beer or a soda…for you youngsters. It’s narrow claw took a few attempts at the bottle top but if you can count to four you can handle it (there’s a good reason an illuminated, bottle opening guitar pic does not exist). There’s a metal arc surrounding the bottle cap opening – an attention to detail which reiterates the thought DIXON engineers put into every design feature, since this will prevent damage to the sturdy plastic housing atop the key during bottle cap removal. Next is the BRITE of the KEY which is a LED light operated with a simple twist of pressure on the cap yielding a light which is strong enough to locate a dropped stick but low enough with a directional focus to avoid the embarrassing explanation after the gig about said ‘stick dropping’. Finally, the most surprising feature was the key itself. Rather than distracting from the actual key use with the additional features, the grip was easier and more secure than traditional keys since it is well balanced and wider than alternatives. 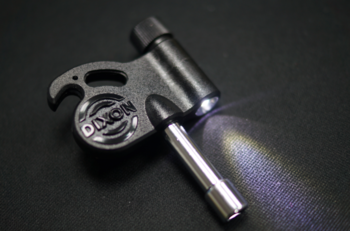 DIXON has improved the key, saved space on your key chain and reduced weight while making the key cool in a 007 kinda way. Unlike the SWISS Army Knife, however, you’re going to keep the BRITE KEY handy and use all it’s cool features.. The DIXON BRITE KEY is functional and fun. Innovative? - Absolutely! Latin Percussion (LP) released Raul Rekow (1954-2015) Congas and Bongos that Raul had recently designed with LP. Any drum release at NAMM is cool, especially with Don Lombardi. This was EPIC, however, with the presence of Raul's Family. What a tremendous honor for DRUMline to be asked to document this event. I found out about the release just minutes before it happened while I was setting up to cover Sheila E. and the Escovedo Family. To have all of this happen so close in time and proximity was very emotional and I apologize to Karl Perazzo for leaving his name out of my introduction. Karl was present as well and was very much in my heart and mind when I shared my memories of Raul Rekow with his family. Don Lombardi mentions Karl several times and Karl will be continuing the exciting LP evolution of his and Raul's legacy. On a chance meeting during a misplaced cell phone search, I met extraordinary jewelry designer Darren Simonian. There are so many talented people at NAMM in so many disciplines and it's always exciting to encounter the unexpected and have your mind blown! 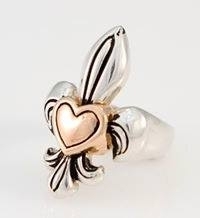 Click Darren's Fleur de Lis design to the left to see more of his incredible work. 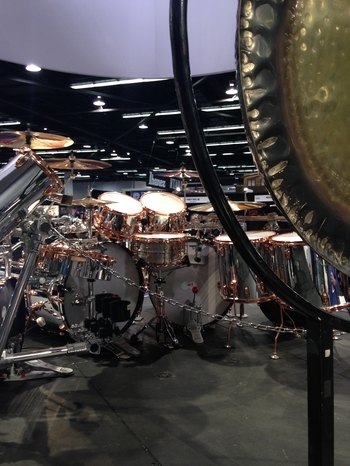 Every NAMM one drum kit stands out as the must see display at the NAMM show. John Douglas' presentation of Alex Van Halen's kit from the 2015 Tour was the gravitational center for the show with consequential photos and buzz all around it. Plus, it was set up smack dab in the middle of the main floor, an unavoidable and exciting display for sure. You'll see a lot of the kit in the background of our interviews because on Saturday I set up shop behind the kit and everybody came to me like moths to a flame, making my job so much easier. I even got the man himself, John Douglas (JD) to talk about his career and the monster VH mirror and copper contraption. MAPLES vs OAKS - are the Oaks really 'too lofty'? 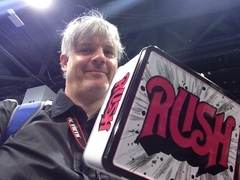 I survived an EPIC RUSH trivia contest to save my lunch from Canadian and Fellow RUSH Nerd Mike Michalkow. There is gonna be a rematch in 2017! NAMM 2016 is coming soon and John Good of DW gives a factory tour of DW producing new Oak drums for the coming year. Note all the attention to detail and innovation which goes into the production. Summer NAMM in Nashville is shorter, smaller and more laid back than it's big brother in Anaheim over the winter...and that's a good thing. 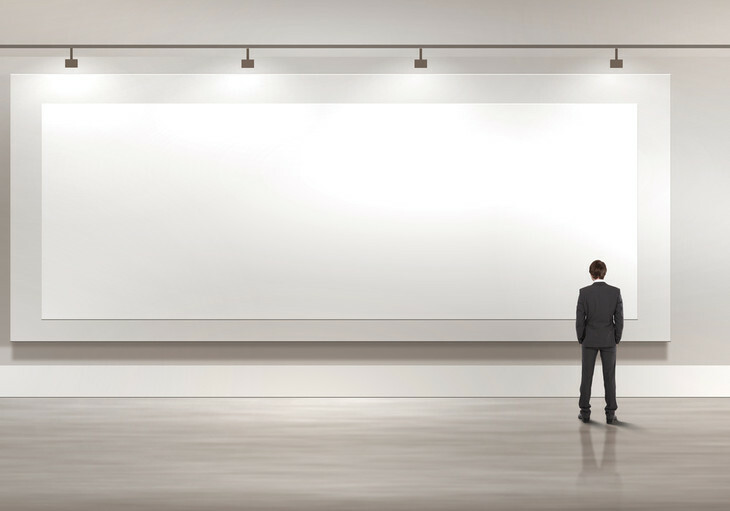 A relaxed atmosphere and fewer exhibits make it easier to see what's being showcased. Plus the close proximity to Music Row and Broadway makes it easy to experience the music and culture of Music City. The Music City Center, which hosted NAMM, is new, spacious and easy to navigate and just blocks from the heart of the city which is busy yet remarkably friendly. 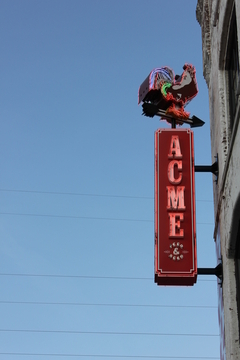 Live Music is pleniful in Nashville, especially up and down Broadway. You can hear most of the bands as you walk by since they often are staged in the front window. The lack of a cover charge, at least early in the evening, made it easy to pop in and out and check out several acts. There's what you might expect, Country, but also a heavy dose of Rock and Jazz. 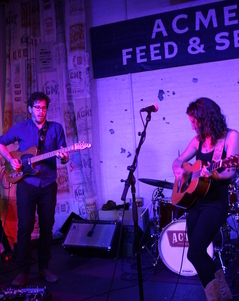 With a booming economy, post Cumberland river flood, and an affordable cost of living, many musicians (i.e Brooklyn Cowgirl Michaela Anne) from all over are relocating to Music City. One of the cool things about NAMM is that Artists will do signings at companies they endorse. ddrum had Vinnie Paul's actual touring kit he used for tours with his band HELLYEAH and Vinnie came to NAMM on Saturday to do a signing for his fans who of course got their treasured selfies. I usually kid with my interviewees that they have to pay for the interview by taking a selfie with me and thus I have an extensive collection of NAMM selfies which is really a fun part of the show. When we launched DRUMline in 2012 Ari Gold got me immediately involved in VH1 Saves the Music and Power Saves the Music - These charities worked to get music back into schools by providing instruments where programs were being cut due to budget constraints...a theme I became aware of via Mr. Holland's Opus - a great film depicting the impact of music on the lives of students and that influence projected to some pretty bright futures. We donated money and also some equipment to the cause. Matt Sorum's charity Adopt the Arts has done excellent work over the same period funding instruments and teachers in schools where the music programs are on life support or eliminated all together. Mr. Holland knew all too well that teaching students to read and write seemed futile if you cut the arts and they had nothing to read or write about. Matt Sorum states that music kept him involved in school and is a vital component for becoming a well rounded confidenct individual. We are psyched to support his wonderful charity. You can click the yellow quote to the left to donate directly if you wish. We are also giving a portion of our donations via our contact page and a portion of our sales via drumlineshop.net to Adopt the Arts. 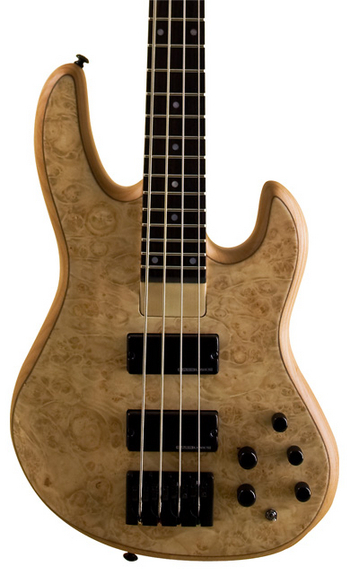 Although not a stated theme at the show, NAMM instruments had a plethora of natural wood finishes to correspond with a 'green' consciousness and encourage plenty of woodshedding in 2014. My favorites included Rickenbacker basses, DW drums and the beauty and functionality of ZON Guitars. Why does DRUMline feature guitars as well as drums? Well, drums don't tell the whole story and although there are drum solos, too many at NAMM...drums are not a solo instrument....we need the other stuff too - particularly the BASS guitars in the rhythm section. Besides, ZON wins my design award for looks alone, but their functionality and ease of playing made them 'Best of Show' in my opinion. Rickenbacker had some absoutely beautiful sustainable wood basses and guitars while DW featured inlaid wood snare drums that were mind boggling in their appearance. We had booth tours of all three and they will be featured below. In the last scene of Raiders of the Lost Ark, the Ark of the Covenant is crated and wheeled into some obscure corner of a vast warehouse. Indiana Jone's last line is 'They don't know what they have there.' Thus the Ark becomes lost once again. Unfortunately much of music's past is becoming lost as time marches on, technology changes and exposure to really good stuff is diminished by the plethora of mediocrity being released in pop culture. There are places, however, where you can discover music's past and learn why appreciating it is the only way to have good music in the future....but like Indiana Jones, you're gonna have to dig a little. NOTE: All pictures are the LA story unless noted otherwise. You'd think AMOEBA MUSIC started in the Haight - Ashbury district of San Francisco during the Summer of Love (1967) when you experience the vibe and visit the store there, but no...it was in Berkeley, CA near the University of California in 1990 that the original store first opened its doors. The coolest feature of the store is not that you can find what you expect, but that you are surprised by what you don't expect. For example, I like Paul Rodgers and of course you can find his excellent solo album 'Electric'. AMOEBA, however, also has Paul Rodgers at a live concert in SPAIN and Paul Rodgers singing only Jimi Hendrix tunes. All three CDs now reside in my collection. Shopping there also inspires you to discover other music since the vibe dissolves some of your perceived barriers. I got a Robert Johnson CD and a Louis Armstrong CD. I put them on iTunes and downloaded them to my iPod. It makes for some interesting listening when my iPod selects Alice in Chains and then Louis Armstrong. Yes, I have an iPod...the technology is here and it's cool, but it's a shame if it excludes so much great music from the past. Us old schoolers appreciate the aesthetic of physically selecting, opening and playing records and CDs, something the youth of today may see as an inconvenience. Yet it is similar to reading a book vs. a computer screen. There is a definite pleasure to the human interaction with the art. The original AMOEBA MUSIC in Berkeley, CA - since 1990. 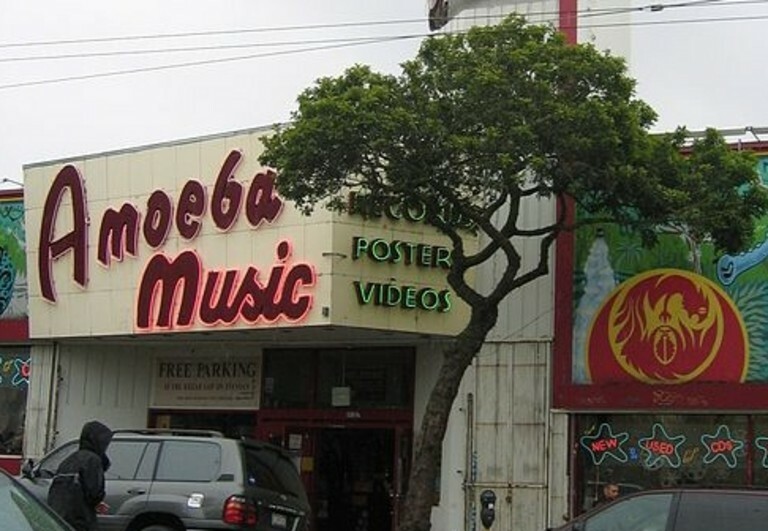 AMOEBA's first store in Berkeley was followed by the San Francisco store on Haight Street near Golden Gate Park in 1997 and the Hollywood location on Sunset Boulevard in 2001. The stores also have frequent live performances and publish a newsletter, 'Music We Like' with staff selections and reviews. They also have movies, posters and other merchandise. If you can't make it to one of the California stores, they have free shipping with no minimum purchase which is a fantastic bargain. You can find much more at AMOEBA.COM. Some 50 years ago in 1963, Frank Zappa appeared on the Steve Allen show (the predecessor to The Tonight Show) and played a bicycle with a bow, drumsticks, blowing through the handlebars, etc. 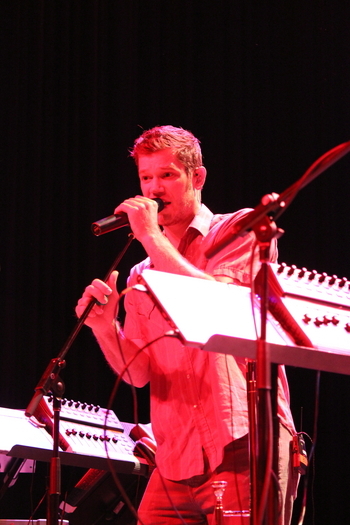 Allen joined him as Frank told the show’s band to play non-musical dissonance. ‘They won’t have any trouble with that’ Allen quipped. Zappa was funny, creative, weird but dead serious about getting some interesting sounds. In the 30 years which followed, Zappa completed 56 studio albums, made films, scored countless works for orchestras, operas, quartets – any and every possible combination of people, instruments and sound producing objects. He also left a vast quantity of unreleased material in 'The Vault'. Either you ‘re a ZAPPA fan or you largely missed him the first time around. You’re getting a second chance, as I am, to discover his work. First…Universal is re-releasing those 56 albums. Also, due to the diligent work of ZAPPA Archivist Joe Travers, new works are being released as well. Joe is also the drummer for popular live performances of Franks’s work in ZAPPA PLAYS ZAPPA led by Frank’s son Dweezil. Besides the advantageous genetics, Dweezil benefits from the osmotic presence of Frank in his life and simply doesn’t understand the improbability of success. 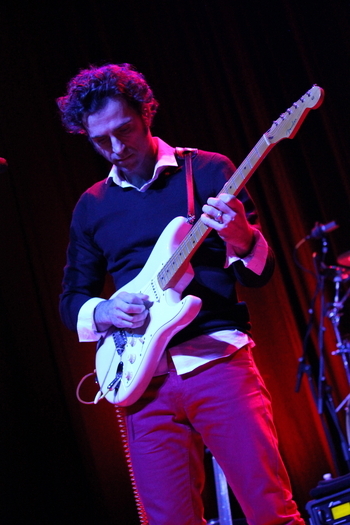 After six years of performances…ZAPPA PLAYS ZAPPA is an established entity having earned its own identity. 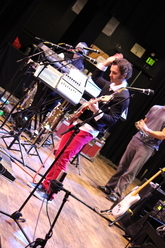 The show doesn’t try to recreate the original ZAPPA performances but plays to the standards which were originally set. Frank despised bands recreating their recorded performances live. He didn’t consider that music. He performed his music live – musicians playing off of each other – knowing the material of course but putting on a performance. I saw ZPZ on 12-12-12 at The Pageant in St. Louis. Behind The Pageant’s logo on the marquee are the words: JAZZ, BLUES, SWING, ROCK, COUNTRY and for the first time in a dozen years, that’s exactly what I saw. My first ZPZ concert...checked it off the ‘Bucket List’…at a time when I’m yearning to see good music performed well and eager to get into something new. Of course I knew of Frank from the 70’s onward but small town stations didn’t play his music. In college, however, it was 'Zappa This' and 'Zappa That'. 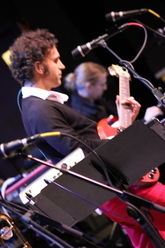 I learned a little bit of ZAPPA music since guys I played with dug it but I was more into other things at the time. Well, on 12/12/12 a generation later and a time for a new beginning I feel kinda lucky. I can now go to the ZAPPA well and discover something new and reinvigorate my love of music…mainly because ZPZ was so damn good and while doing my research to interview Joe Travers, I discovered so much great Zappa music. The audience covered a pretty diverse demographic with the commonality of coordinated bobbing heads in sync with the band. My only regret was watching the show from the side of the stage – not the ideal mix. The opportunity to watch Joe Travers up close, however, was too tempting. I chose to watch Joe ‘drive the bus’ as he puts it. Joe’s enthusiasm for ZAPPA music and music in general is contagious. I gave him a little tour of the neighborhood including the Chuck Berry statue, Vintage Vinyl and Blueberry Hill – home of Berry’s guitar and St. Louis’s best cheeseburger. ZPZ understands well where good music originated, but with their own unique vision educates and entertains us toward a promising musical future. Whether you know Frank’s music or not: hit your bicycle spokes with sticks, listen to classical music or try something unusual. It will do wonders for your creativity…and if you have the opportunity to see ZPZ…go and Freak Out! Before the sale of Crate and Ampeg a few years ago, those amps were made in St. Louis, MO at St. Louis Music (SLM). I even have a Crate Blue Voodoo Tube Amp designed by my old college jamming buddy, Obeid Khan. Khan designed some cool tube amps for Crate but with the sale of SLM, he has since designed his own line of amps, 'Reason'. Bob Friedewald has his own company as well, Bob's Custom Amps, and has designed custom amps for: Billy Gibbons, Kid Rock, Geezer Butler and a long list of professionals. 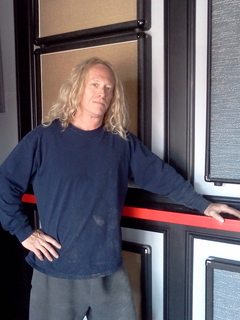 You can see Bob's attention to detail on the cool amp walls he built for The Halo Bar at The Pageant in St. Louis, MO. SLM nurtured some creative talent which remains after its sale, yielding innovative artistic and sonic progress in music. Check out more of Bob's excellent work at bobscustomamps.com. 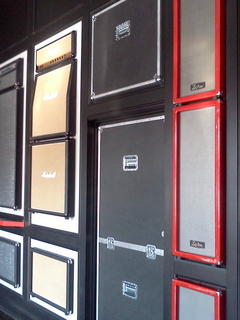 Whether you want a custom amp, amp wall or refrigerator disguised as an amp, Bob Rules! Also, check out Obeid Khan's tube amp line at reasonamps.com. An excellent and respected guitar player as well as a top flight electrical engineer, Obeid is always chasing a better tone and building it into his amps.